The Mahindra group's Igatpuri plant has become the first in India to be declared carbon-neutral. 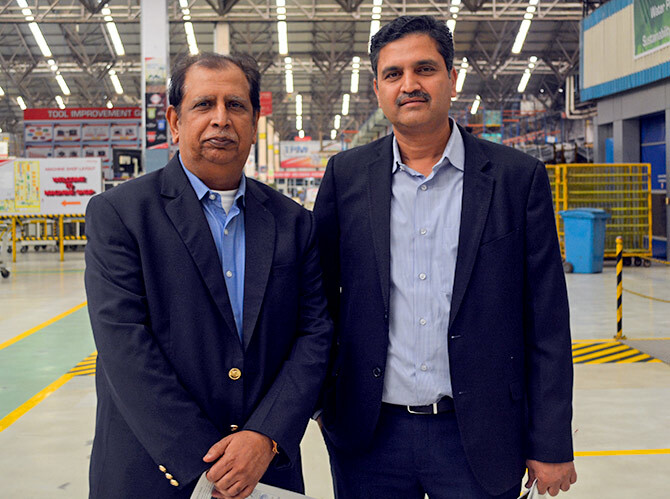 Ashish Narsale / Rediff.com reports from the factory on how this was achieved. 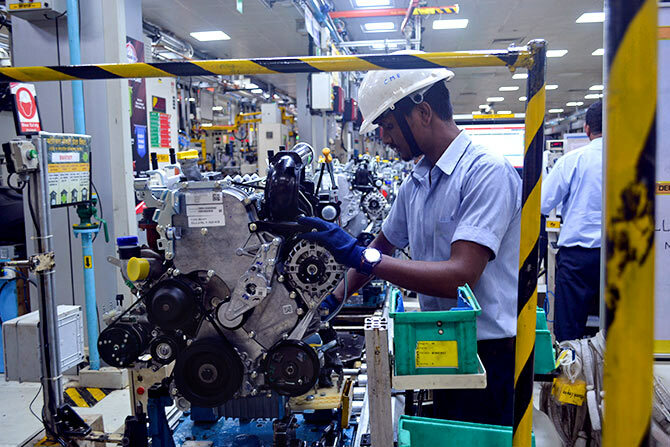 Mahindra's engine manufacturing plant at picturesque Igatpuri in Maharashtra is now a carbon neutral manufacturing facility, certified by Bureau Veritas (India) Pvt Ltd. This is in keeping with Mahindra's goal of making all its plants carbon neutral by the year 2040. Addressing the press on the occasion, Vijay Karla, CEO, Mahindra Vehicle Manufacturers Ltd, and Chief Manufacturing Operations, at Mahindra and Mahindra, said, "We were able to achieve this feat through energy efficiency, a sharp focus on the use of renewable energy and painting of trees to absorb residual carbon." 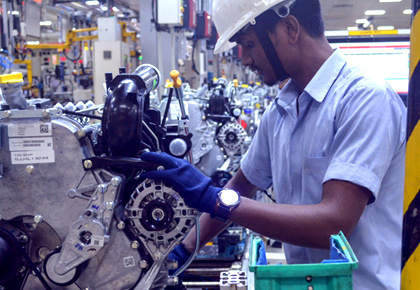 Mahindra's Igatpuri plant spans over 100 acres, and has a production capacity of 1286 engines per day. How exactly does the Mahindra group plan to achieve its target of making all its plant carbon neutral? Through methods to conserve energy, the use of renewable energy, and waste and water management techniques. Mahindra has set its internal carbon pricing as $10 per tonne of carbon emitted to fund investments required to pursue the path of carbon neutrality, a price which is determined based on international benchmarks and assessment of what was required to achieve the goals set by it on energy efficiency and renewable energy. Use of LED lights, which consumes less power and is low in maintenance cost. Replacing old motors with new power efficient ones, which will reduce energy consumption by six to 10 per cent. Replacing old HVAC (heat, ventilation and air conditioning) systems with power efficient ones. Heat recovery projects such as making use of heat generated by the machines. Using solar panels to generate electricity from sunlight. Use of windmills to generate electricity from wind. Use of LNG (liquefied natural gas, which gas super-cooled at -165 degrees and then passed through a diffuser to convert it to usable gas) and LPG when available for furnaces and other heating systems in the plant. LNG, is cheaper in terms of price. Installation of vacuum glass window that will reduce the heat entering buildings by 34 per cent, thus reducing the load on HVAC systems. Recycling of water from toilets, kitchen and paint shops, and reusing it in gardening, toilets and paint shop. Rain water harvesting by constructing artificial ponds. Factory generated waste will be recycled or converted instead of sending it to landfill. For example, the hand gloves, paint sludge etc disposed of from the factory are used by cement factories for generating heat, and some waste is used for making bricks and roads. Implementation of paper-free environment by avoiding the use of corrugated boxes and promoting the use of internet. Through water management techniques like rain water harvesting and water recycling, Mahindra claims to have run the plant for 241 days by using only the managed water. Waste management, in which waste from the kitchen is used for generating bio-gas. Use of recycled packaging material; the factory proposes to turn 'zero wood plant' in a month's time. Over 100 acres of plant land is covered by naturally found flora and fauna. The plants also help in reducing the dust level by 50-60 percent. The building is modified to run on renewable energy and is certified as a green building. Introduction of cold testing for diesel engines to reduce the use of diesel. Use of bio-diesel extracted from naturally found karanja seeds in cars and other vehicles used in the campus and factory. 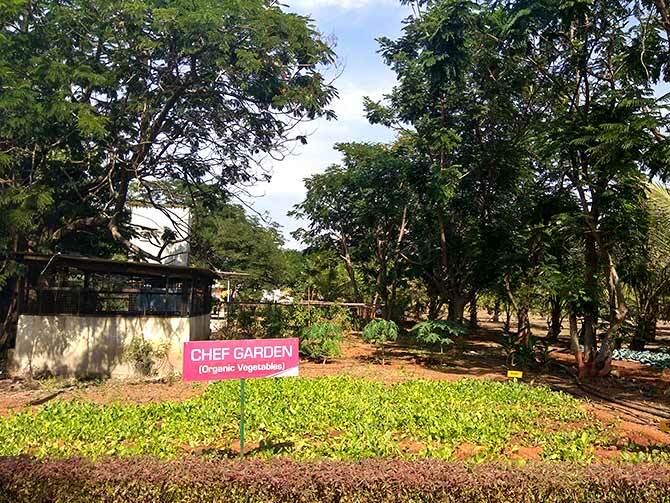 Food waste from nearby places, internal kitchens and clubhouse is used for generating bio-gas. Use of heat generated by machines and compressors is tapped and used for heating water. Plantation of 30,000 trees, which work as a carbon sink. Vegetable and other food items required for the factory kitchen are cultivated in the facility itself. 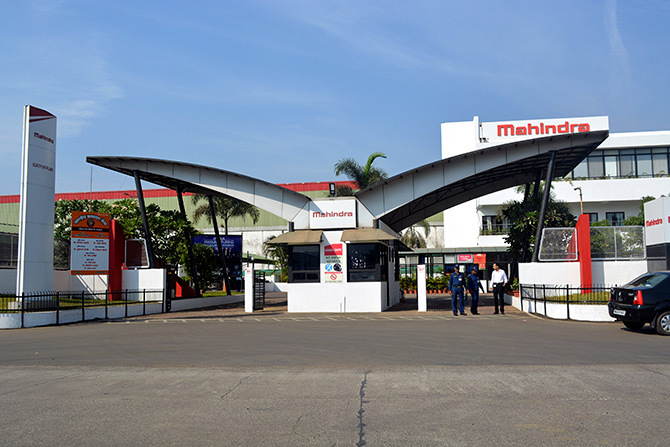 As one enters the Mahindra factory the first thing one spots is the mechatronics labs where the engineers are developing and testing future prototypes. The prototypes were harnessed with the latest technology like IoT (Internet of Things) and Cloud for storage. The word 'mechatronics' is derived from a combination of mechanics and electronics, explains Nasir Deshmukh, senior general manager, operations. 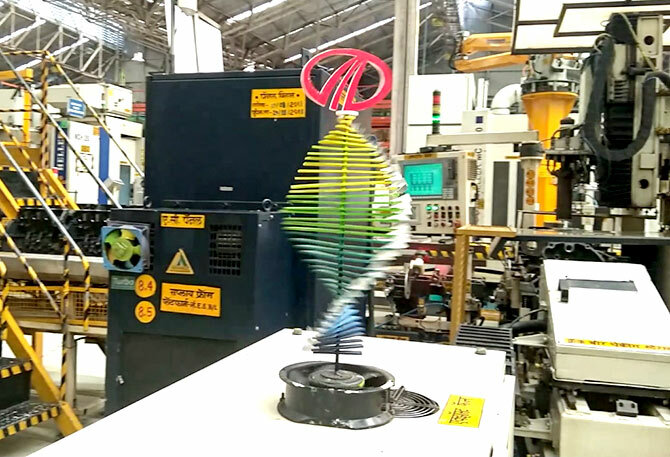 Mahindra uses state of art technology for realtime monitoring of machine health, or critical parameters like RPM, temperature and pressure, and the notifications are sent to mobile phones. The employees even make use of paper artifacts to keep track of the machines in motion. Mahindra makes use of gravity-fed conveyor which works without electricity. Since it is inclined towards the destination, when a package is placed at the source point, it slides to the destination. At the Mahindra factory we even saw a cobot at work. What is a cobot, you ask? It is a collaborative robot used to perform precision work, and is controlled by the engineers at work. You can see the full walk-through in the video below. Are we ready for Carbon trading? The recipe for a thrilling weekend!